It has had a marginal-to-low impact on extinguishing black money, curbing fake notes, reducing currency in circulation, and lowering the proportion of high notes in the economy. New Delhi: The Reserve Bank of India’s annual report comes during a week when the debate around the failure or success of demonetisation has intensified. Earlier this week, for instance, multiple media reports noted that the BJP used its majority in the parliamentary standing committee on finance to derail discussion and delay the panel’s final report on demonetisation, which is reportedly extremely critical of the note-ban exercise. The central bank’s annual report that came out Wednesday – which includes an assessment of India’s currency management, a subject that has a number of implications for the impact of demonetisation – lays out a few implications of how one of the Modi government’s most controversial policy decisions has played out nearly two years later. Hours after the report was released, the Ministry of Finance held a press conference, where department of economic affairs secretary Subhash Chandra Garg declared that demonetisation had achieved its objectives but declined to provide further information and expand on this statement. What does the RBI’s report tell us? The Wire breaks it down. One of the primary justifications behind demonetisation was that the Indian economy was suffering from a prevalence of fake or counterfeit notes. S. Gurumurthy, now an RBI board member, had hailed demonetisation in November 2016 for the blow it would deal to counterfeit currency. While the actual estimate of fake Indian currency notes (FICN) has been hotly debated, the central bank’s annual report implies that demonetisation may not have done much to curb the generation of new fake currency. For instance, the detection of fake Rs 50 and Rs 100 notes spiked the most in at least three years in the financial year ending March 2018. While 6,453 pieces of fake Rs 50 notes were detected in 2015-16, this number jumped to 9,222 in 2016-17 and then increased to a whopping 23,447 in 2017-18. In terms of 100 notes, 2,21,447 fake pieces were detected in 2015-16, which slumped to 1,77,195 in 2016-17 (the year of demonetisation) but then bumped back up to 2,39,182 in 2017-2018. The new Rs 2,000 note – which was initially believed to have come printed with better security measures – was also not immune to counterfeit. Data presented in the RBI’s annual report show that while only 638 pieces of fake Rs 2,000 notes were detected in 2016-17, it jumped up to 17,929 pieces (worth Rs 36 million approximately) in 2017-2018. While overall detection of counterfeit notes was 31.4% lower than the previous year, this was because of a decrease in fake Rs 500 and Rs 1,000 notes, which were of course banned in November 2016. In fact, the new Rs 500 notes that were issued have seen a bump in terms of counterfeit detection (199 pieces in 2016-17 to 9,892 pieces in 2017-18). In the immediate aftermath of demonetisation, a new narrative of a ‘demonetisation windfall’ took place. The thinking behind this theory was that if a certain amount of the demonetised currency didn’t come back into the system – if it was dumped in a river or burnt to ashes because its owners were afraid of being caught with black money – it would reduce the RBI’s liabilities. This, apparently, would ultimately translate to a higher dividend payout to the Centre. This theory, in part, was bolstered by estimates that were put forth by seemingly credible sources. For instance, the SBI’s economic research department, headed by chief economist Soumya Kanti Ghosh, predicted that up to Rs 2.5 lakh crore wouldn’t come back into the banking system. Niti Aayog member and senior economist Bibek Debroy indicated that approximately Rs 1.6 lakh crore – 10% of the demonetised currency – would be extinguished and not come back into the system. These estimates, it has now become clear, were wild guesses: the RBI has indicated that 99.3% of the demonetised currency or roughly Rs 15.31 lakh crore was returned. A little over Rs 10,000 crore is still out ithere – although there are a number of factors that could still account for this money. For instance, parts of the Rs 10,000 crore could lie with money seized by law enforcement, cash still being held with district cooperative banks and in bank notes being held by citizens of Nepal and Bhutan. Now, even if 100% of demonetised currency returned to the system, it does not mean all of this cash was ‘white’ or money that was generated through wholly legal means. It is the job of the income tax department and various investigative agencies to determine how much of it is ‘black’ or illegally obtained and which depositors need to be examined for trying to cheat the system. So far the government has not put out any credible evidence as to its efforts in this regard. At a press conference on Wednesday evening, senior finance ministry official Subhash Chandra Garg refused to elaborate on how demonetisation helped crack down on black money. Another narrative that made the rounds after demonetisation was that the Indian economy had too many high-denomination notes. 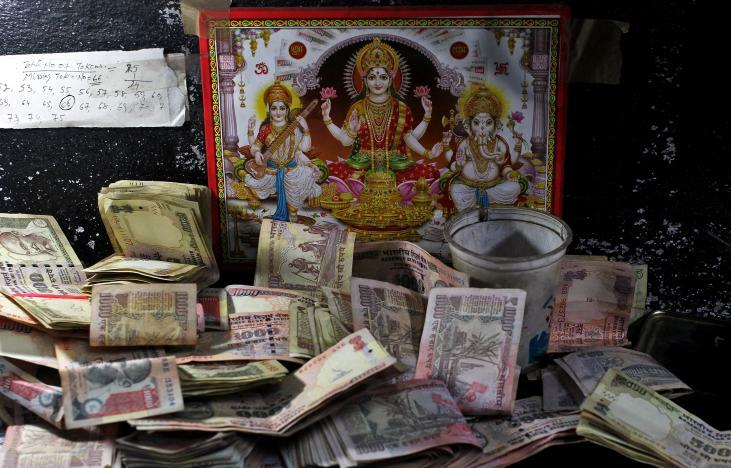 ‘Swadeshi’ economist S. Gurumurthy, who was recently appointed to the RBI’s board, called it a “much-needed attack on excessive liquidity”, while other government officials decried the high proportion of Rs 500 and Rs 1,000 notes. The RBI’s annual report, however, indicates that demonetisation has not made a huge dent in this regard, as the proportion of high-value notes is marginally lower now than what it was pre-demonetisation. In March 2017, the share of Rs 500 and Rs 2,000 currency notes, in value terms, accounted for 72.7% of the total value of banknotes in circulation. This increased to 80.2% at the end of March 2018, according to the report. Before demonetisation, Rs 500 and Rs 1,000 notes accounted for 86% of the currency in circulation. Overall, the value of banknotes in circulation increased to Rs 18.04 lakh as at the end of March 2018, a 37.7% year-on-year increase. There was, however, a 2.1% increase in the volume of banknotes. While The Wire has over the last eighteen months reported and analysed how India’s currency-in-circulation (CiC) and currency-to-GDP ratio has not changed drastically after demonetisation, the RBI’s annual report provides further proof of how little things have changed. As of March 31, 2108, the CiC accounted for 101.8% of its pre-demonetisation level. “This works out to around 88% of its underlying three-year-trend had there been no demonetisation,” the central bank notes. India’s currency-to-GDP ratio is also slowly on its way back to pre-demonetisation levels. “…India’s currency to GDP ratio moved up to 10.9 per cent in 2017- 18, returning to being amongst the highest levels of currency usage in peer emerging market economies (EMEs) and advanced economies (AEs) as well. In consonance, the use of digital payments, which had surged to a peak in December 2016 in the aftermath of demonetisation, fell back to the elevated post-demonetisation trend before rising in recent months,” the RBI notes. The currency-to-GDP ratio was 12.1% in 2015-16 and fell to 8.8% in 2016-17 after demonetisation. The annual report, curiously, also provides a glimpse of how attempts at remonetisation over the last year focused heavily on supplying the new Rs 500 and Rs 200 currency notes. The report also shows that only 40% of the Rs 100 notes that were scheduled to be printed in 2017-2018 were supplied. “…the supply of banknotes was lower [in 2017-2018] than that in the previous year, but was noticeably higher compared to the pre-demonetisation year,” the annual report notes. Overall, the supply of currency notes declined by 14% in 2017-2018. As The Wire has reported, various states of India experienced a cash crunch earlier this year, with ATMs running dry. The lesser number of Rs 100, 50 and 20 notes being supplied in 2017-18, and the ATM system’s inability to adapt to the new Rs 200 notes quickly enough may have played a part in the cash crunch. Note: In an earlier version, 17,929 pieces of Rs 2,000 notes was wrongly calculated to add up to around Rs 360 million. The correct figure is around Rs 36 million.